Tough moments may sometimes feel like the norm rather than the exception, especially when you are bombarded by situations out of your control. Such tough moments can be very challenging. They hit at the very core of the value you see in yourself. They can make even the strongest doubt who they are. I believe it can be easier to bounce back, or even claw your way back up, if you fill your heart, soul, and mind with a better story. If you like who you are now, the better story is working. If you don’t like who you are now, or how you feel now, you can start a better change by improving the story you are telling yourself. He changed his story by changing himself. A better story is a great starting point for choosing how you feel, how we act, how we respond. Creating a story of kindness, love, respect, and gratitude will fill your heart with light, create clarity in your mind, and deepen the goodness in your soul. It really is up to you to decide, even right this very moment, what story you will create for yourself. p.s. Take 13 minutes today to activate the #PowerOfThree by focusing on three things within your control. 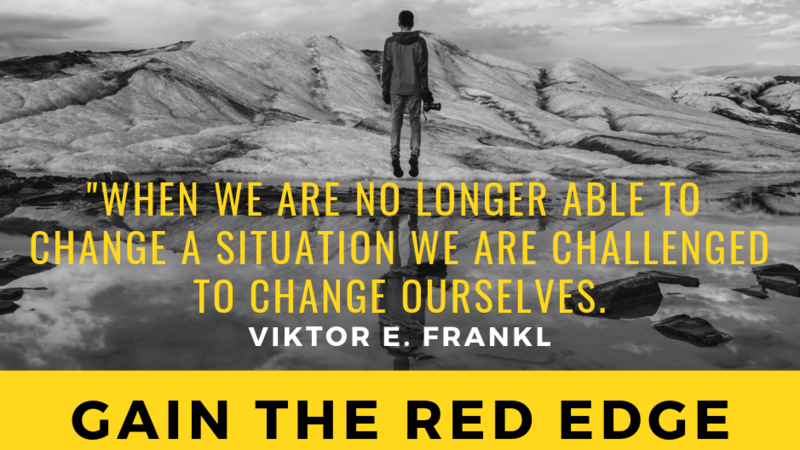 Discover how you can “Gain The Red Edge” by focusing your efforts, clarifying your message, sharing your story, and creating impact with a complimentary Gain the Red Edge mentoring call.